When I mention De Niro’s name here,I’m not only talking about his Oscar-winning performance,but also his insistence of getting the film made and his dedication to the Jake LaMotta role.Scorsese is never a sports fan,at that time,he was particularly interested in making films about music.He made a musical film New York,New York in 1977,and shot a documentary of The Band called The Last Waltz in the following year,when De Niro approached him with the story of a former boxing champion as early as he was making Alice Does Not Live Here Anymore in 1974,the director showed little interests in making it.It was De Niro’s persistence that finally persuaded the young filmmaker to have a try. 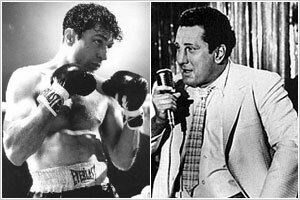 In order to present the authentic image of Jake LaMotta in the later scenes of the film,and more importantly,to get the actual feeling of the character,De Niro neglected the advice from the make-up staff that it could be done with rubber padding and went on with his weight-gaining plan.He even asked the whole cast and crew to stop shooting for a month to give him enough time to be the exact fat LaMotta.He did it by eating spaghetti like crazy,his body weight was increased by nearly 60 pounds,he had to lose them after the shooting because they already had done damage to his health.De Niro also learned his boxing skill from the real-life LaMotta and after 1000 rounds training,he was as professional as a real boxer and even won some real games.If this back-stage story is not the textbook for all method acting actors,I don’t know if there is any exists. 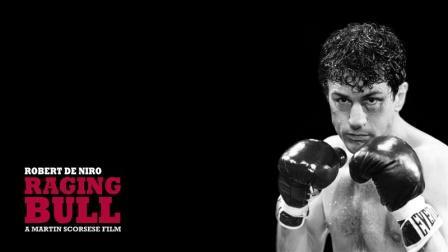 I don’t like boxing,I hate the brutality in it,every time I saw a boxing match in TV,I switch channels,but it did not happen to me when watching this boxing film.As a matter of fact,the boxing scenes are my favorite parts of the film,my eyes couldn’t move away from it,I actually couldn’t help swinging my fists like a mad man after watching it,which scared my wife a bit. Scorsese and cameraman Michael Chapman made it like a ballet,a ballet as delicate as in the film The Red Shoes,which is a personal fave of the director.The amazing thing about these scenes are that the camera was almost in the ring all the time,and they were able to shoot it in all different angels with different techniques like all those slow-motion shot and subjective shots.There are two great scenes which worth to be pointed out,one is the close-up shot of the blood drops from the ring rope,and the other is the heat wave effect in one of his games against Robinson,these two brilliantly shot scenes add dramatic tension to the sports,I couldn’t image they did it a better way. Remembering Haig P. Manoogian, teacher. May 23, 1916 – May 26, 1980. With Love and resolution, Marty. 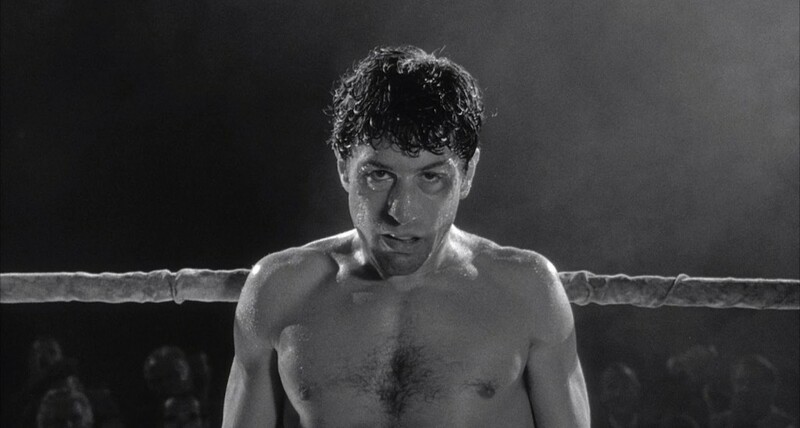 I think it’s a brilliant citation,Scorsese insists in the special feature that this means his teacher helped him “see”,and has nothing to do with the Jake LaMotta role itself.But for me,I do think it can also be interpreted as a summary of the plot and main character.If you notice it carefully,there were many scenes with a cross in the obvious position,which indicated some kind of religious meanings about sins and redemption. Jake LaMotta was “blind” in 95% of the time,he was only able to “see” towards the end and it was too late. What are your thoughts on this film?